The Moons path through Earth's shadow on Oct. 17, 2005. Eclipses of the Sun and Moon usually come in pairs. A solar eclipse is almost always accompanied by a lunar eclipse two weeks before or after it, since in two weeks the Moon travels halfway around its orbit and is likely to form another almost-straight line with the Earth and Sun. This month will be no exception. Two weeks after casting its shadow across Europe and Africa on October 3, the Moon will swing around to barely skim through the northern edge of the Earth's own shadow. Most of North America, the eclipse will be seen before or during dawn on Monday, October 17. Ironically, those who enjoyed the sight of the solar eclipse earlier this month will not be able to see the lunar eclipse since it will occur when the Moon is below the horizon, during the daytime. For central and eastern Asia, Australia and New Zealand, the eclipse comes during Monday evening, during or after dusk. In the United States and Canada, those living in the Pacific and Mountain Time Zones should be able to see most, if not the entire visible range of the eclipse as the Moon descends toward the western horizon. Alaska and Hawaii will see the entire eclipse from start to finish. Along a line running roughly from the Arrowhead of Minnesota, south to the southern tip of Texas, the Moon will be setting just as it is leaving the Earth's dark umbra. 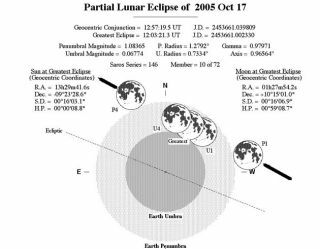 Farther east, along a line running roughly from Buffalo, New York south across central Florida, the Moon will be setting just as it is entering the umbra. It is debatable whether the dark shadow will be visible to those living in the region between these two lines. Remember that an eclipsed Moon sets right around the time when the Sun is rising. As such, the brightening, almost-daylight sky at that time may cut as much as 15 minutes from your eclipse viewing. The western sky needs to be a bit darker and the Moon needs to be a bit higher; at least clear of any horizon haze so that you can have a clear shot at it. That's why the western states will have an advantage over those located farther to the east. An accompanying timetable shows what to look for and when. The first event listed is the Moon entering the penumbra, the faint outer extremity of the Earth's shadow. But this shadow is so light that the Moon doesn't begin to change appearance until the Moon's diameter has penetrated it by at least 70 percent. Around that time, look for a very slight shading or smudginess on the upper left portion of the Moon. As the minutes pass, the penumbra becomes more obvious. Those living in the eastern states might catch a glimpse of the penumbra before the Moon sets. The next event listed is the Moon entering the umbra, the dark inner part of the Earth's shadow. This is the beginning of partial eclipse. The umbra is much darker than the penumbra and fairly sharp-edged. Partial eclipse lasts only 58 minutes. At its deepest, the umbra will extend only 6.8 percent of the way across the Moon's diameter. The umbra's edge will completely miss the large, brilliant rayed crater Tycho, but will appear to graze the crater Clavius. After the maximum eclipse, the Moon will soon exit the umbra and soon the penumbral shading will gradually fade away. The next lunar eclipse will be strictly a penumbral event and will occur on March 14 of next year and will favor Europe, Africa, western Asia and the eastern United States and Canada. The next total lunar eclipse will not come until March 3, 2007.